This post is part of the multi-blog #maccheesemania, coordinated by Rachel from Rachel Cooks and Brandy from Nutmeg Nanny. There are all sorts of great mac and cheese recipes from some fantastic bloggers, and a chance to win some great prizes (details at the bottom of this post). Prizes include Door to Door Organics Gift Cards, OXO Gift Baskets, Zak Designs Prize Pack, a year's supply of Cabot cheese, a Vermont Creamery gift basket, a risotto kit from Marx Foods, Barilla pasta, Anolon Advanced Bronze 4.5 Qt. Tapered Stockpot, Rachael Ray Stoneware Casseroval, Wusthof CLASSIC Studio Block Set, Microplane Graters and Kitchen Tools, a SavorX Starter Block with spices, and Le Cordon Bleu by Swissmar oven to table roasters. All giveaways open to US residents over the age of 18 only. So let's get right to the recipe, shall we? This was inspired by my love of mushrooms. And I guess it reminded me of Swiss-mushroom burgers. Without the burger part. Choose whatever mushrooms you like - all one kind, or a mix. For some reason, the mushroom section at my local grocer was pretty barren, so I used white button mushrooms. Baby bellas might have been better, but to be honest, I like fresh button mushrooms, and in this quantity, it had a lot of mushroom flavor, and a perfect balance with the cheese. As for the cheese, a basic Swiss is fine, or you can go to the fancy cheese section and go crazy. The choice is yours. As far as those red pepper flakes, add as much or as little as you like. I added a hefty pinch so the mac and cheese had a nice zing. Use a tiny knife and spread the butter - no, just kidding. Melt the 2 tablespoons of butter in a skillet, dump in the crumbs and stir until all the butter is absorbed and the bread is lightly toasted. Remember, this gets cooked more in the oven, so you're not looking for a dark toast. Since my bread crumbs included the bread crusts, mine started out a little darker than if I had made my crumbs from just the bread middles. Set the crumbs aside until needed. You can make these well in advance, or right before you need them. Heat the oven to 350 degrees and have a a 1 1/2 quart baking dish standing by. Larger is fine, if you don't have the perfect size. Or you can cook in several smaller dishes, if you like. In a large saucepan or skillet or saucier (big enough to hold all the sauce, plus the noodles, after they're cooked) melt the 4 tablespoons of butter. Add the mushrooms, salt, pepper, and red pepper flakes. Cook until the mushrooms are cooked through and most of the liquid disappears. Add the flour and stir. It will become very dry. Add the milk and stir, scraping the bottom of the pan well. Bring to a simmer. Add the creme fraiche, stir to combine, then begin adding the cheese in small handfuls, stirring after each addition to incorporate the cheese. Add the cooked pasta and chives, and stir to coat the pasta with the cheese. The liquid should be thick, but not goopy. Thin enough to call it a liquid. If it seems too thick, add some of the pasta cooking water to thin it out. Transfer the mixture to the baking dish and sprinkle the bread crumbs evenly over the top. If it's a really tight fit in your baking dish, you might want to put it on a baking sheet, or put a sheet of aluminum foil under it to catch possible drips. Bake at 350 degrees until the cheese is bubbling around the edge of the dish. 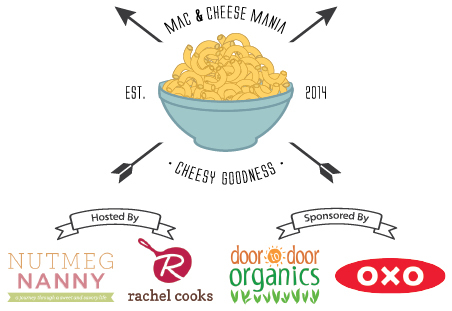 Be sure to visit all the other great bloggers participating in Mac and Cheese Mania! Go to Rachel Cooks and/or Nutmeg Nanny and enter to win some great prizes!